One of the first steps in developing a successful website is to determine the site’s “Audience, Issues and Approach” (AIA). This helps clarify the site’s goals, identify the intended audience and what the audience needs or wants from the website. For this website redesign, Carol Tompkins met with her clients, Cynthia Toops and Dan Adams, to determine their goals for the website. 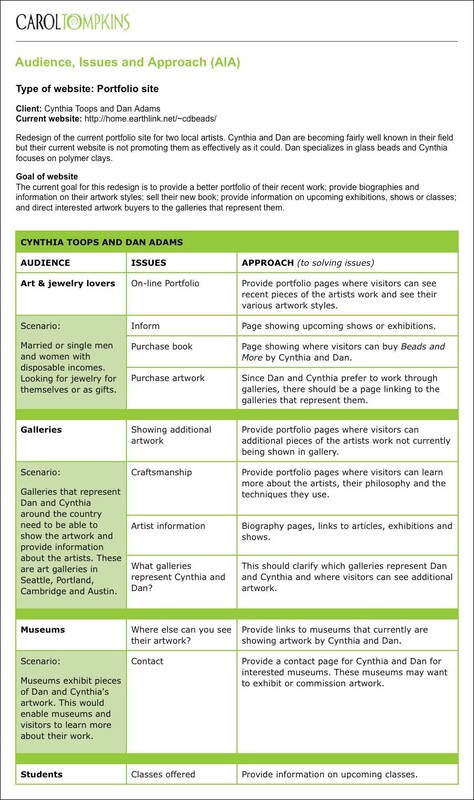 The goals were to provide a better portfolio of their recent work; provide biographies and information on their artwork styles; sell their new book; provide information on upcoming exhibitions, shows or classes; and direct interested artwork buyers to the galleries that represent them. Once the goals of the website were established, the next step in the AIA process involved identifying and interviewing potential site visitors to determine what the various visitors would want (issues) from this website. Once these issues were identified, different approaches to solve the issues were proposed. The AIA was presented to the client for review and signoff. This process helps plan a website that will successfully fulfill a client’s goals and meet the visitor’s needs.